It seems like a no-brainer to advise brides to get shoes that are comfortable. But it's a tip Mindy Weiss finds herself repeating to her clients. Go-to shape: Choose a strappy sandal or a pump. Mule and slingbacks can be hard to keep on your feet and they make a clopping sound. Get glamorous in this gorgeous open toe pump. Dyeable satin upper features eye-catching ornamentation. Lightly padded footbed. Leather sole. The perfect shoe for your special occasion! Posted sling-back with a pointed toe. Satin upper. Pleated vamp detail has rhinestone accents. Elasticized heel strap. Leather sole. 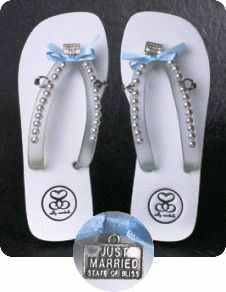 Wedding thong: Flip-flops are fine if the wedding isn't formal. Pick shoes first: Buy the shoes before your first gown fitting. Wear them to each fitting to make sure the hem is right. Which white: Don't wear white shoes with an ivory gown or ivory shoes with a white one. Color is cool: It's OK to wear a color like blue if you feel like it. The glitzy 'Cyrus' sandal from Nina Shoes is perfect for a night out on the town. Satin or metallic leather upper. Elasticized sling-back strap. Lightly padded footbed. Covered heel. Non-skid sole. All that glitters: Watch out for rhinestones; they can snag the dress. If you really love sparkly shoes, run a piece of delicate fabric over them to see if they cause snags. Avoid the nosedive: Scuff the bottom of the shoes with sandpaper before wearing them. Au naturel: Bare feet are for the beach.